A WELL-KNOWN American neo-Nazi has been recorded being given out to by his father in the middle of a livestream with another white supremacist. 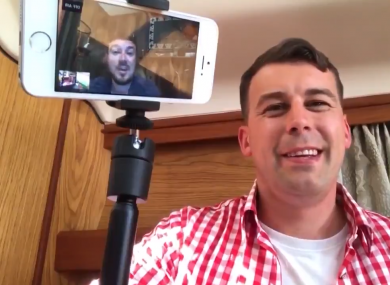 The footage emerged in a video showing 35 year-old Jason Kessler in conversation with Patrick Little, who ran for the US Senate this year on a platform which called for the US to be “free from Jews”. Little responds by asking whether the demand is coming from a “drunk roommate”, to which Kessler replies “something like that”. As he tells Little that he is living with “somebody who supports Orthodox, like Israeli [views]” with whom he disagrees, Kessler’s father continues to reprimand his son, saying “I want this to stop in my room, Jason”. Kessler, who helped to organise the Unite the Right rally in Charlottesville, where one person died last year, later admits that the person shouting with him is his father. He explains that he has been living with his parents due to mounting legal costs associated with the rally, and that he has had to endure “constant anti-German propaganda” on the History Channel. The video is reportedly a number of weeks old, but only gained attention this week. It comes just weeks after Kessler organised a second ‘Unite the Right’ in Washington DC, when just 20 people showed up. Kessler had applied for a permit for around 400 people, and the protest was met with more than 1,000 counter-protesters. Email “'Get out of my room': 35-year-old neo-Nazi censured by father in livestream with fellow white supremacist”. Feedback on “'Get out of my room': 35-year-old neo-Nazi censured by father in livestream with fellow white supremacist”.